“That some of our advertisers have recovered from their writer’s cramp and can send us a check. “That the Dorchester Board of Trade in 1927 will accomplish something that will benefit the community. “That the Boston Elevated Railroad will someday be able to adjust its car service to the satisfaction of everyone, particularly at the Andrew Square Station, where things are getting worse.”That the police department will speedily cope with the so-called crime wave, which may exist in some places, but not in Dorchester. “That motorists using Dorchester Avenue (which has been known as Death Avenue) will remember that little children will cross a street at anytime. The same thing holds true on all other Dorchester streets. “That business conditions locally will improve, thus filling up the hundreds of vacant stores in the district. 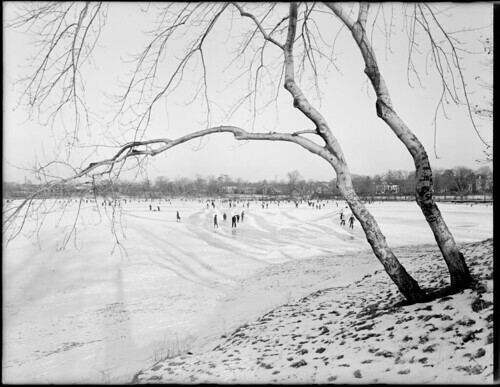 Above: Ice Skaters on Jamaica Pond, 1930. This entry was posted in Dorchester, Old News and tagged Dorchester, Jamaica Plain, New Year, Resolutions, Winter. Bookmark the permalink. Where did the photo come from? I’ve never seen it before. I preprogrammed it a couple months ago so I don’t remember well. Usually I try to link to the source. I think it might have been a Digital Commonwealth photo. Thanks. That site is new to me.